You want a piece of me?! And my bodyguard! Two of poker’s genuine good guys–Matt Marafioti and Jon Aguiar–almost sort of got in a fist-a-cuffs at the 2012 WPT Legends of Poker on Friday. Marafioti was escorted out of the tournament area, but was allowed to return. 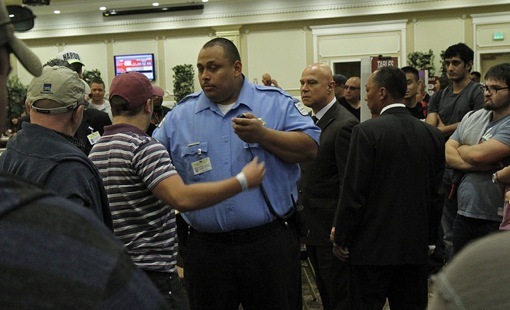 Aguiar was eliminated not long after the “altercation.” Marafioti, who is on a nearly unprecedented roll of ambassadorship never seen before in poker, survived the day stacked at 54,000. In related news, the WPT Legends of Poker kicked off Friday. Michael Lipman ended Day 1A as the chip leader with 257,100. He’s followed by Vadim Bulavchik with 242,200. Other notable big stacks include Joseph Cheong (112,500), the man the myth the legend, Black Phil Ivey, Big Sldick, the one and only Dwyte Pilgrim (106,600), Lee Markholt-Watkinson (105,400), and Jeff Madsen (99,500). * Photo courtesy of World Poker Tour.